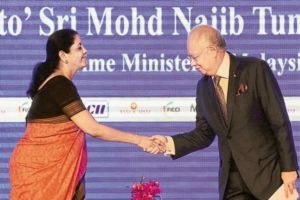 India and Malaysia have signed Memoranda of Understanding (MoUs) worth $36 billion in the fields of oil and gas, infrastructure and engineering sectors. Indian companies such as Adani Ports, Andhra Pradesh Gas Distribution Corporation and Natco Pharma have signed 31 such pacts with their Malaysian counterparts to facilitate investments in both countries. The developments were part of the visit by Malaysian Prime Minister Najib Razak to India. This is Razak’s third visit to India since he took office as Prime Minister in 2009. Razak, who started his five-day visit to India on 30th March in Chennai, visited Rajasthan, as well where Malaysian companies are engaged in road and other infrastructure projects estimated to be worth over $1 billion dollars.